Thousands of children in the Spanish region of Galicia already know the story of Jasir. His journey begins in Africa in the 18th century and finishes in the United States. A history of slavery and pain, but also of hope and overcoming: the history of the gospel music. More than 2,500 children have already seen this musical, thanks to a project that has already visited schools, hospitals, cultural centers and churches. It is an initiative of the Gospel Life Choir, in particular, of its section called “Gospelittles”, which aims to bring the gospel music to children. At first, it was a one-time initiative, but it had such a good acceptance that it has settled as a project. After the first presentation in a school, “we immediately had the desire to repeat the activity in other schools. 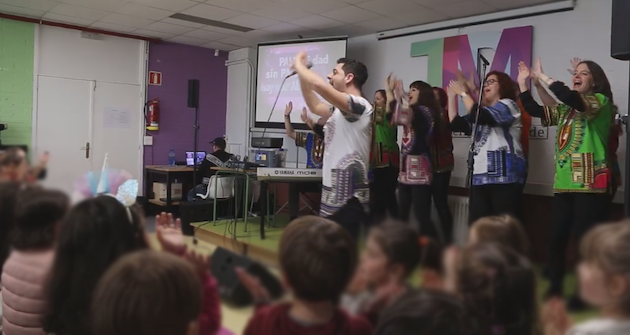 We received requests for more performances in other schools, which confirmed the idea of developing a more elaborate project to bring gospel music to children”, Marcos Hofkamp, project coordinator, told Sanish news website Protestante Digital. 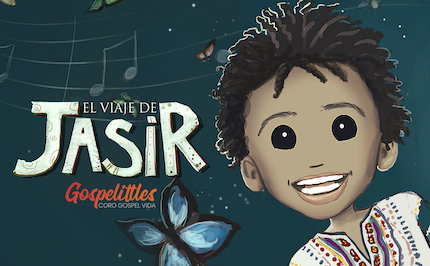 Jasir’s journey integrates gospel songs with storytelling and illustrations, made by design artist Natalia Rosales. Jasir is a boy who leaves Africa with his family, as slaves, and they arrive in North America to work in cotton fields. “The musical teaches about the horrible reality of slavery. Like Jasir, you can find very bad situations and very big injustices, maybe some will be resolved, but others not”, says Fernando Plou, one of the members of the Gospelittles team. “Jasir teaches us that there is a way of living without anger or bitterness, in the midst of those situations. The slaves sang and believed that God listened to them. And that faith gave them hope in the midst of pain and suffering”. Through Jasir’s journey, “children will learn that there can be difficult situations, for which there is no immediate solution (or even that may never be resolved), but we can all choose how we want to live. And we can all also decide how we want to influence the world around us”, the team explains. The musical also tackles the issue of bullying. “The storyteller explains how love, kindness, meekness, humility and other important values can help many people to live better”. “Children must learn that it is not good to laugh at others, or reject someone because they are from a different race, or from a different country, that we should not belittle others because they have less money, or because they are less popular”, Fernando Plou says. Jasir’s journey is having an excellent acceptance. “We are really surprised. In the first year, we reached more than 2,000 children. And in the first three months of this second year, there are already almost 700 more children. In some schools, the presentation has been made two years in a row, and there are several other schools interested”. Part of the success is that the musical is very participatory. “We include songs in English, Spanish and Galician. Therefore, we give teachers of various subjects (music, religion, English, Galician, etc.) the possibility of rehearsing some songs prior to our performance”, they said. “The children sing with us several of the songs. In fact, the response has been so good that we have already brought Jasir's journey to some children's hospitals”. In addition to the show, each student recieves a book about Jasir’s journey. “We had the story of Jasir and the beautiful illustrations of Natalia Rosales, so we thought about the possibility of making a book to leave in each school, for them to have it available in their libraries”. But, “immediately, we began to dream of preparing a book that we could give to every child. The Lord moved some hearts who, generously, donated the necessary amount to print 3,000 books”. Now, each time they bring the musical to a school, they give a full-color book to each student. The book, in addition to the story of Jasir, includes some pastimes and reading comprehension questions. It is also available in digital version on Amazon. Gospelittles hopes that this open door could be used by other communities, so that they offer all the needed material to those who are interested so that it can be used in other places and contexts. This material includes the script for the storyteller, the videos and lyrics for multimedia and even the rehersal kits for the musical part. You can contact the team of Gospelittles on their website (Spanish).